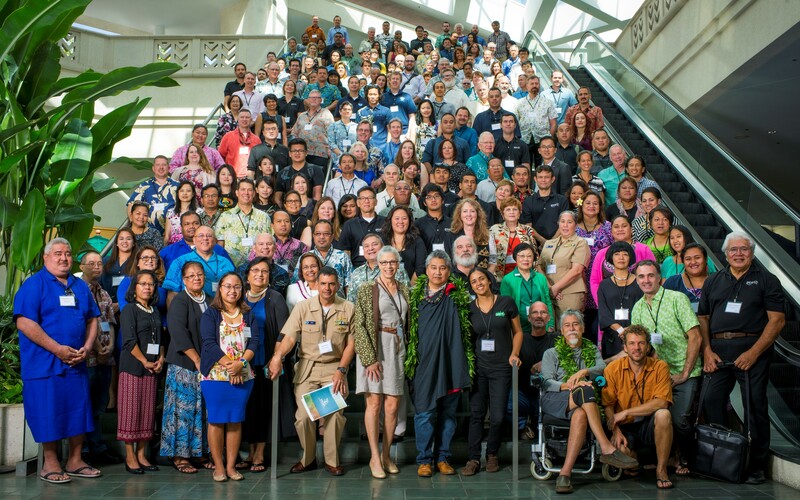 The Pacific Risk Management ‘Ohana (PRiMO) conference is the premier venue for community leaders interested in protecting Pacific Island communities from natural hazards. Each year, hundreds of participants gather to make connections, learn from each other, discuss ongoing initiatives, and design action plans. This year's conference theme is "Technology and Disaster Risk Reduction," and took place in Honolulu, Hawai'i on August 6 to 9, 2018, at the Hawai'i Convention Center. The diverse group of attendees includes heads of state, representatives from business, nonprofits, and environmental groups, and concerned citizens. Topics range from water quality to disaster management and economic sustainability. This diversity and collaborative focus is what makes PRiMO work. People and organizations must work together if communities are to become more resilient. The action plans must be far reaching if Pacific Island natural resources, quality of life, infrastructure, homes, economic framework, and citizen health and safety are to be preserved. This is a tall task that requires inhabitants of the region to work and learn together. PRiMO provides that opportunity. PRiMO conferences offer at least 25 different sessions, many led by distinguished leaders and innovators. Field trips and preconference training sessions provide opportunities to increase professional skills and gain firsthand knowledge about active hazard-reduction activities. Participants return to their organizations with new skills, information, ideas, contacts, partners, and perspectives. They leave better equipped to find the creative solutions today's coastal hazard challenges require. Each conference has a community resilience-focused theme. Attendees are encouraged to submit an abstract, for it is through sharing with one another that we all become stronger! Sign Up for PRiMO Notifications! View the 2018 conference program here. View the 2018 conference videos on our Facebook page. Congratulations to the 2018 PRiMO Award Recipients! Through its annual awards, PRiMO recognizes and honors outstanding partner efforts that foster collaboration while embodying the spirit of PRiMO. The awards were delivered at the annual meeting, August 6 to 9, 2018 in Honolulu, Hawai‘i. This award recognizes exemplary individual or team accomplishments that enhance the sustainability, effectiveness, and public image of PRiMO and PRiMO partners. The award recognizes outstanding partnership efforts that enhance the resilience of Pacific communities.